Surely the facts are not in dispute, Shirley. “The pope, the former Archbishop Joseph Ratzinger, was addressing his weekly general audience at the Vatican after days of disclosures concerning the German church, where one case happened on his watch before he became pope in 2005. The pope’s comments on the scandal in Ireland came a day after a top Vatican official acknowledged on Tuesday that, with only 10 people handling such cases, his office might not be adequate for the task. But the official, Msgr. Charles J. Scicluna, who is effectively the Vatican’s internal prosecutor, said the church was working to bring more “transparency” to the delicate and emotional process of settling allegations of abuse by priests, which have severely damaged the church’s moral standing. “Severely shaken” . . .but not stirred. Not to mention the broader obfuscations. At the Vatican, Monsignor Scicluna’s comments on Tuesday, rare for an official in the famously reticent Congregation for the Doctrine of the Faith, were part of a broader Vatican defense against the rising abuse scandal in Germany. Last weekend, Monsignor Scicluna told L’Avvenire, the newspaper of the Italian Bishops Conference, that his office had examined 3,000 abuse cases in the past decade, most of them from the United States. The ratio of 10 people handling 300 cases a year did not go over well in some quarters. “It seems like an extraordinarily paltry effort, given the scope of the crisis,” said David Clohessy, the national director of the Survivors Network of Those Abused by Priests. They’ve seen it from the limo. This week, the German church suspended a priest who had been allowed to work with children for decades after a court convicted him of molesting boys. 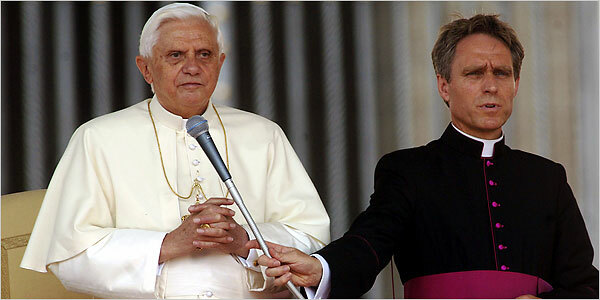 In 1980, Archbishop Ratzinger allowed the priest to move to Munich for therapy after allegations of abuse. Despite the small number of people in the Vatican working on such cases, he stressed that his office was the last step in a long process for the cases, after they have been investigated by “hundreds of canon lawyers” in dioceses worldwide. “It’s not that these people are doing every case from A to Z, otherwise we’d really be bonkers,” he said. The German Bishops Conference announced Tuesday that it would open a sexual-abuse phone line on March 30. The line would be for victims and professionals, but also for abusers. Father Cocker will now open it up and dry it out.